I had read some time ago that "No Rest-No Mercy" was Stairway's finest effort ever. Unfortunately it was a bit hard to find until Retroactive re-released this gem in 2005. I can certainly agree with what I had read. 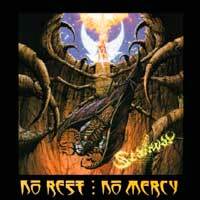 "No Rest-No Mercy" is good, solid, English heavy metal in the NWOBHM tradition. There is nothing fancy here nor anything over-the-top. The singer isn't screaming at the top of his lungs or growling. There are no downtuned grooves or blastbeats. The guitarist isn't shredding at 100MPH, although there are plenty of meaty guitar solos. Rather, Stairway play straight forward heavy metal. Had this album been released in the very early 80's, they would have been listed at the top of the NWOBHM heep. Unfortunately this was originally released a decade after that scene broke wide open, so it's no surprise that many people don't know who Stairway are. For those who love that old school metal sound, however, this is a CD that certaily needs to be added to your collection. It most certainly is the band's most solid, heavy album. Even the melodic, acoustic ballad "Sweetest Song" is a good song that comes off as genuine rather than cheesy and forced. Two of my favorite cuts are "Walk Away" and "Battle of Heaven", both of which are heavy with memorable choruses and blazing guitar. "Keep the Fires Burning" is the most commercial song of the group, but even this song isn't sappy and reminds me slightly of something you might have heard on Def Leppard's "On Through the Night". Even the production here is remeniscent of those early NWOBHM classics. Audiophiles may be disappointed, but for those who remember when heavy metal was about passion and raw energy, this CD won't disappoint. It should also be noted that the incredible cover art was painted by legenday artist Rodney Matthews. Rodney has also done work for such bands as Asia, Yes, Seventh Angel, Detritus, etc. Average English heavy metal sounding a bit like the early 80's NWOBHM releases, but for some reason I never could get a grasp on this album. I have owned it several times, only to trade it off for something I was more interested in. However, I always manage to get another copy and give it another chance. I really respect this band for several reasons; their longevity, their dedication to their particular style of heavy metal, their unwillingness to follow trends and their awesome lyrics. So, while this is not my favorite CD, I still think there is some redeemable value to it. I was a bit apprehensive about this album mostly due to the fact that I was not a fan of the band's "Bleeding Heart" CD. However, a friend bought "Hallowed Ground" and played me a few tracks. While the band has stayed true to their style from discs past, they have improved their songwriting and production quite a bit. "On Hallowed Ground" is British heavy metal with some powerful and emotional lyrics. Each and every song, seems to have a spirit of worship to the Almighty, which really attracted me to this disc and kept me listening. Within the first two days of owning the disc I had already played it three times. For the most part, the music contained herein stays within the mid-paced heavy metal mode, but there are also a few brushes with some blues riffing, as well as a couple of ballads. Stairway don't seem concerned with being flashy or showing off their technical abilities, but instead they put an emphasis on emotion and thoughtful lyrics. Refusing to give into trends, Stairway return with their fourth studio release of unashamedly, pure and simple British Heavy Metal. 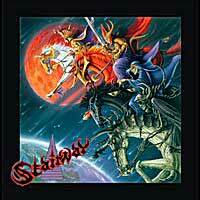 Stairway continue to combine elements of straightforward hard rock and heavy metal without a trace of concern for trendy modern power metal or modern rock. In other words, you won't hear any stop/start riffs or down tuned guitars here. Instead, this band proudly fly their classic metal flag high. Stairway are nothing if not consistent. To some this might sound like a bad thing, but to any long time Stairway fan, or fan of quality classic heavy metal, this is exactly what we want from this band. Despite words like consistent and simple, however, "The Other Side of Midnight" is not boring or mediocre. Rather, Stairway offer up plenty of diversity from track to track. "Burn" starts off as a slow brooding number with a Dio-era Black Sabbath feel to it and builds up to a more upbeat number. "No Mercy" and "Soldiers Of Heaven" are upbeat, heavy rockers, "Taste The Blood" is a slightly more epic number, "She Calls" has a bluesy feel to it, and "Cantabile" is a moody, melodic instrumental. This particular song has a bit of a Michael Schenker flare to it. Vocalist Graeme Leslie has improved with each new CD. Here he adds a bit more grit to his usual, mid-toned, clean vocal style. The lyrics from this band remain positive and spiritually focused. 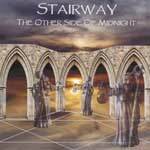 Overall, "The Other Side of Midnight" is Stairway's best release thus far and should please any fan of early 80's NWOBHM style. Stairway come from the land where heavy metal was born, England. Their sound is lost in a time warp, which some may find off-putting. However, anyone pining for the days of classic, straight-forward heavy metal will find much to enjoy with "Interregnum". Stairway sound like their were formed in 1978 and "Interregnum" sound almost as if it could have been release in the mid-1980s. (Actually this band was formed in '78.) A song like "Ride the Wind" gallops along like it was written in 1982 during the beginnings of the NWOBHM movement. The song is heavy, melodic and features galloping guitar riffs, some nice guitar leads and vocals with just a touch of grit. With that description, it pretty much sums up the whole of the album. There are no real surprises. The band never veers into any sort of modern rock or never blends other styles of heavy metal into their sound. For the most part the songs are all mid-paced, with the exception of "Enter the Light" and "The Battle's Over", which are both up-tempo tracks, though neither cross over into speed metal. Where Stairway's sound really differs from the average 80's NWOBHM band is in the guitar work of Pete Jennens. At times his lead work has a tasty neo-classical feel. Some of the guitar leads, such as in the previously mentioned "Ride the Wind", remind me of a young Yngwie Malmsteen. The other noticeable difference is in the lyrical approach. Whereas many of the early British heavy metal bands were very dark in their lyrical approach, Stairway's lyrics deal with themes from a Christian perspective. The only thing holding this CD back is a thin production. The drums sound very sterile and the overall mix of the songs are a bit narrow and thin. A fatter guitar sound is definitely in order for this band, though I don't find this overly distracting in the light of the fact that the band's sound is very retro to begin with. However, I still would have preferred a beefier guitar sound and a wider mix. This definitely would have given the album more life. "Interregnum" will remind those of just the right age of a classic, golden age of heavy metal when Uriah Heep, Rainbow and UFO ruled the English scene and bands like Angel Witch, Saxon and Tygers of Pan Tang were emerging as the new wave of heavy metal.